5. Join the new wireless signals with the new passwords. That's it to get up and running. FASTER TRANSMISSION RATE: Supports IEEE 802.11ac - The newest generation of wifi technology which is 3 times faster than the previous 802.11n products and the total transmission rate up to 1200Mbps. HIGH SPEED: Dual band network speed up to 2.4GHz(300Mbps) and 5GHz(867Mbps), enjoy smooth online gaming and HD video. HIGH INTENSITY SIGNAL: Fast wired connections using 4 ethernet/lan ports and experience a wider and more stable coverage by 4 high power 5dBi external antennas. SMART WIFI: Gain parental control over inappropriate content, monitor network activity, speed control, block malicious websites, prevent information leakage, and create select password-protected guest networks. 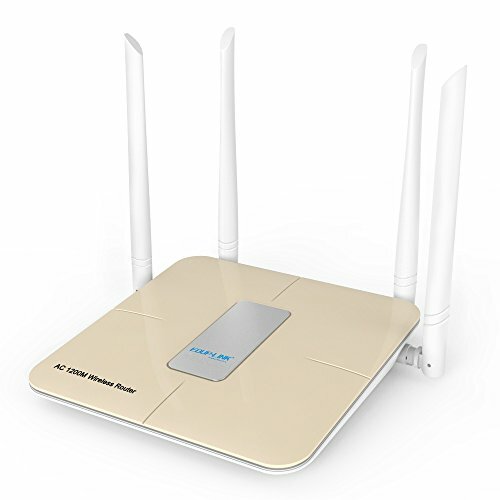 PERFECT SERVICE: 1200Mbps wireless wifi dual band router offer 2 year warranty and 24/7 technical support. Any problems on setup, please CONTACT US via emails or Q&A.